Culantro is native to Latin America and the Caribbean and is related to cilantro. 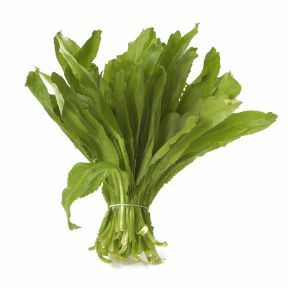 It has tall, stiff, serrated leaves with a prominent central ridge and a more penetrating aroma than cilantro. Culantro is used extensively in Southeast Asia and parts of the Caribbean, especially Cuba and Puerto Rico. In Asia, culantro is most popular in Thailand, Malaysia, and Singapore, where it is commonly used with or instead of cilantro for soups, noodle dishes, and curries. The Vietnamese use it to wrap other foods. Candied culantro seeds were popular in eighteenth-century Britain as a tonic, a cough remedy, and an aphrodisiac. Names: chadon, shadon, shado beni or bandhania, Recao, cilantro ancho, long, wild, or Mexican coriander, fitweed, spiritweed, duck-tongue herb, sawtooth or saw-leaf herb, sawtooth coriander. Handling: Culantro is used fresh in salsas, chutneys and marinades, or added to soups, stews, and sauces. Preserve Culantro by blending the chopped herb with olive or grapeseed oil and freezing the mixture for future use. Keep unwashed Culantro, wrapped in plastic, in the refrigerator for up to a week.